The Suzuki Cappuccino was a miniature convertible/t-top sports car that was built from 1991-1998 as an attempt to add some sportiness to the Suzuki lineup in the Japanese domestic market. In a photograph it looks like a Mazda MX-5 competitor, but with a total length of only 129 inches and a 1598 lb curb weight, the Cappuccino was closer to a shopping cart and it conformed to Japan's Kei (Keijidosha light car) regulations that gave buyers a tax break and easier license/insurance requirements. Today, they are very affordable in Japan and the few that have emigrated stateside are cheap as well. 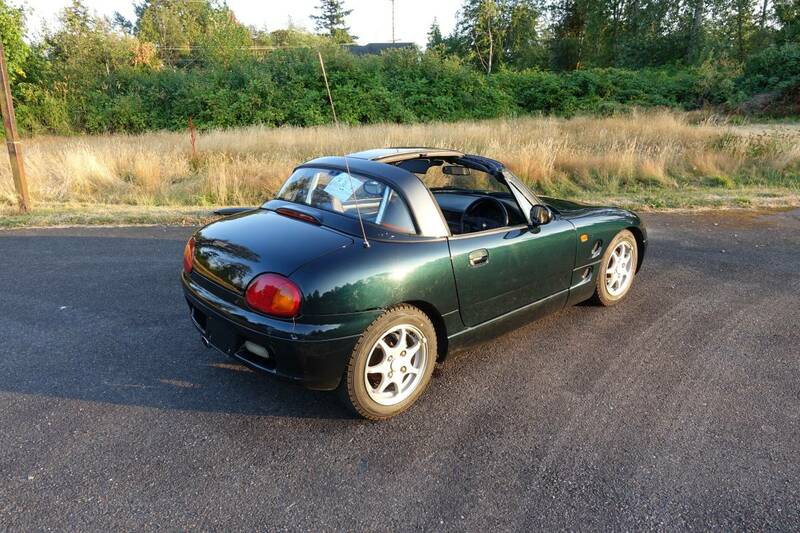 Find this 1993 Suzuki Cappuccino offered for $6000 near Bellingham, WA via craigslist. Tip from FuelTruck. 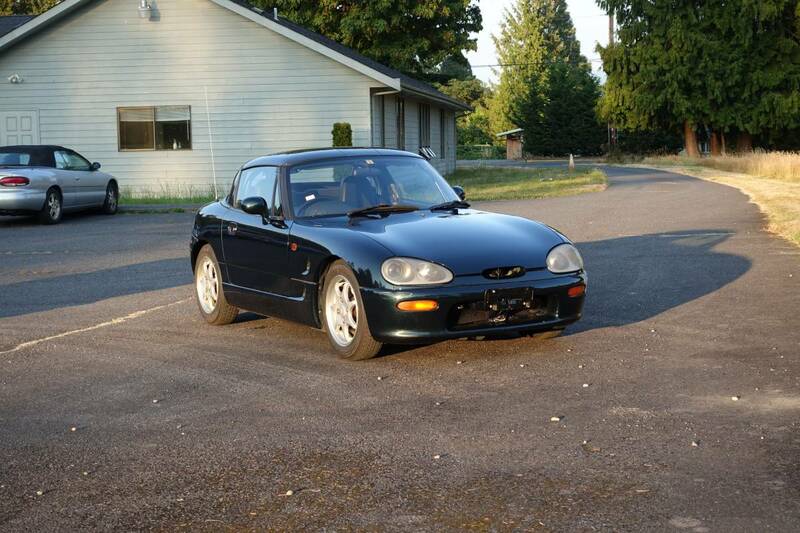 I'm selling my Jade Green Suzuki Cappuccino. It's a right hand drive Kei car imported directly from Japan into my name. I had help from my importer theimportguys and it was a breeze. The car is in great shape with only a few small cosmetic flaws. It is rear wheel drive, 5 speed, turbo charged and has a 3 cylinder 660cc engine in the front. The roof can be a hard top, T top, or a full convertible if you store the panels in the trunk and put the rear window and roof bar down. It has the fake leather interior that is superior to all of the cloth interiors that most JDM cars have. 122000 km. I have all of the bags for the panels and all of the pieces of the car except the space saver spare tire. The car has fully adjustable coilovers and a strut tower brace. It has a momo steering wheel and HID headlights in projector housings. It has an aftermarket head unit with aux and USB. I removed the muffler and had a custom welded pipe made for it. It has a roll bar as well. Front bumper is beat up and cracked in a few places. The rear bumper has a small crack on the right side. Wheels are in OK shape, they could use a little curb repair and a repaint but they're all straight. The interior is in great shape with no tears or blemishes in the seats. The driver door panel has a few slashes in the covering from where a shoe or something gouged it. All of the gauges work and electronics work. It has a couple oil leaks during driving but not when it sits. The car is slow, but very fun. It gets looks and comments everywhere you go, especially if you're as tall as I am, 6'5" and fit no problem. It only weighs 1500lbs and also has only 64hp with 10 psi of boost. Call me, text me, email me, smoke signal me, beep me, stalk me, I'm easy to get a hold of. More common to see the other two HDB ABC cars (Autozam, Beat, Cappuccino) than this one. Now that they’re past the 25-year import restriction, they’re starting to pop up with regularity. Each distinctive in its own way and would be fun to own as a third, fourth, or fifth car and drive on back roads. Or manifest a death wish and drive in heavy east/west coast interstate traffic. Make that JDM, not HDB. Damn fat fingers!